Barbara Cowan gives her resignation speech to the Antioch School Board at Wednesday’s meeting. In an evening that began with comments by and about Superintendent Dr. Don Gill’s announced resignation, at Wednesday’s Antioch School Board meeting, took a surprising turn with the resignation of School Board Trustee Barbara Cowan, one year before her term was up. 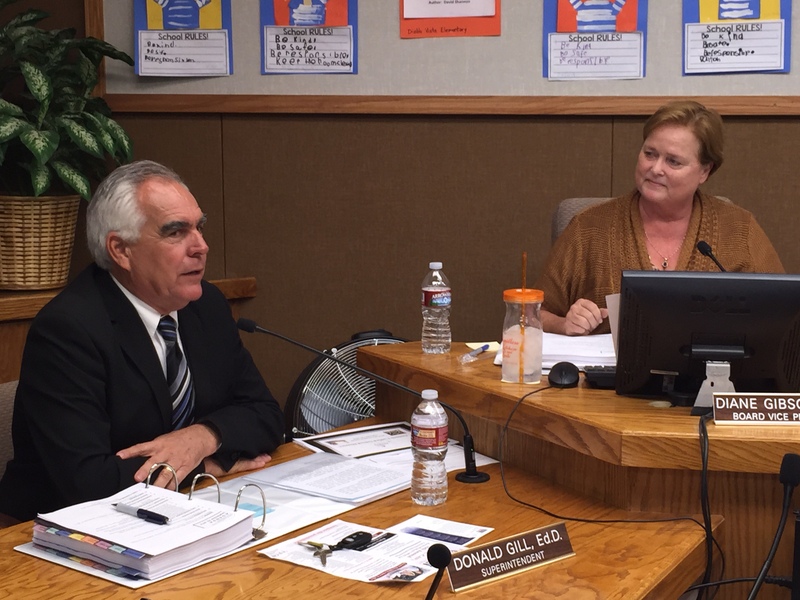 Dr. Don Gill speaks of his announced resignation while Antioch School Board Trustee Diane Gibson-Gray listens, during Wednesday night’s meeting. 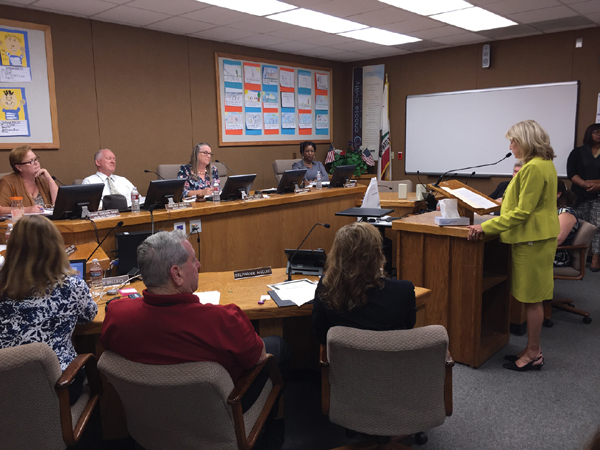 At the beginning of the meeting, Board President Claire Smith announced that during an earlier closed session, the board voted 5-0 to accept the superintendent’s letter of intent, to resign. Then, during public comments, Cowan’s husband Richard Asadoorian spoke, spoke giving glowing accolades about her and listing her accomplishments, in what appeared to be the beginning of a re-election campaign announcement. But, then his comments turned critical and he spoke of transparency. “After the 2014 election, something changed,” Asadoorian said. 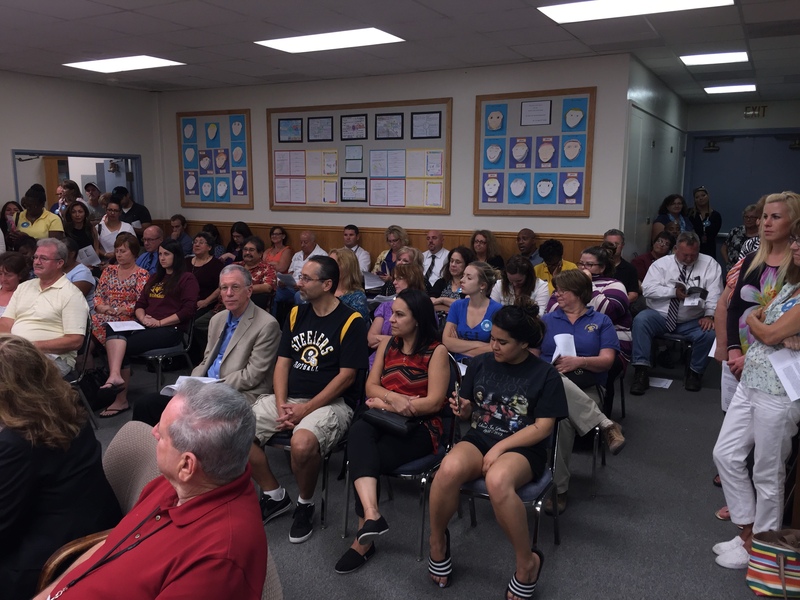 A standing room only crowd filled the chambers at Wednesday night’s Antioch School Board meeting. 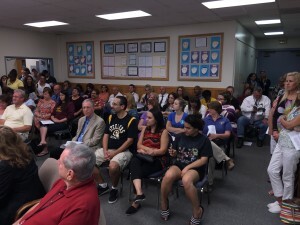 That was followed by a loud round of applause from the unusually large, overflow crowd for a board meeting, made up mostly of teachers and other district staff. They were wearing buttons with the slogan “We Are Stronger Together” and in attendance to encourage the district in its negotiations with their union. Following her husband and speaking from the podium after literally stepping down from the dais, Trustee Cowan showed her emotions, as she read from prepared notes, in which she resigned, effective immediately. Cowan proceeded to outline the reasons for her resignation. She then spoke of individual staff members being “criticized and scrutinized” and the “low morale and apprehensive atmosphere” in the district office. Cowan then took a seat in the audience, next to her husband. Public comments continued with positive comments from both Willie Mims and Angel Luevano about both Gill and Cowan. He then directed his comments toward Gill. During a break in the meeting, Cowan and Asadoorian left the meeting and were greeted with hugs, handshakes and farewells from friends, supporters and district staff. They will be moving to their Oregon home in Sun River in a week and a half. At the end of my term in November, 2016, my husband and I planned to move back to our home in Oregon. Since my election in 2012, I have felt that my mission was to support the District, Staff and our students with wisdom, caring, and using my experience to make the best decisions for our children. For the first two years of my term, the Board, the Superintendent, and Antioch staff created and implemented progressive policies and programs that enhanced and enriched our students’ education and their lives. We improved school culture, relationships, and academics through PBIS, Restorative Justice, the African American Male Initiative, and by working closely with community advocacy groups such as Parents Connected. We expanded the very successful linked learning and academies that have become renowned throughout the State as model programs. We recognized and awarded teachers who have demonstrated excellence in special ceremonies at Board meetings. We made our schools safer by hiring and training more effective security personnel and hiring a professional security company, Strategic Threat Management. We wholeheartedly embraced LCAP and its requirements to demonstrate our successes by stringent metrics and outcomes. We enjoyed a special alliance with AEA and CSEA. The principals and school site administrators we hired during those two years have proven to be outstanding and very effective. November, 2014 proved to be the beginning of a new and unfortunate direction that the Board has taken. Individual staff members have been criticized and scrutinized. Proposed programs by school sites and District personnel have been rejected time after time which resulted, in some cases, in employees not being paid in a timely manner. The low morale and apprehensive atmosphere in the District office is palpable. The calling of multiple special Board meetings sent a disconcerting message to staff and community. I have come to the conclusion that this Board will continue on its negative course and I, as a minority of one, have no power to pull us out of this morass. I am, therefore, submitting my resignation as Trustee of the Antioch Unified School Board of Education effective this evening, Wednesday, September 23, 2015. This entry was posted on Wednesday, September 23rd, 2015 at 8:59 pm and is filed under News, Education. You can follow any responses to this entry through the RSS 2.0 feed. You can leave a response, or trackback from your own site. So her home was in Oregon. Why was she on a school board in California? Sounds like that in November 2014 board members were elected that actually represented the wishes of the public. Left her in a minority of one. Is her husband a quitter too?